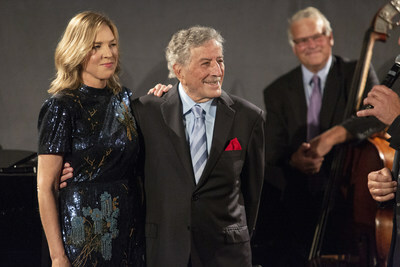 The longest time between the release of an original recording and a re-recording of the same single ("Fascinating Rhythm") by the same artist is 68 years 342 days, achieved by Tony Bennett (USA) in New York, New York, USA, on 3 August 2018. 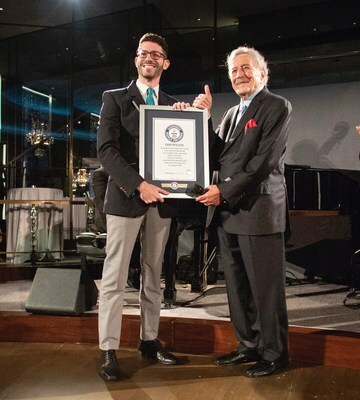 This marks Bennett's third GUINNESS WORLD RECORDS title as he currently holds the titles for the Oldest person to reach No.1 on the US album chart with a newly recorded album for Tony Bennett and Lady Gaga: Cheek to Cheek and Longest time between UK top 20 albums. Verve Label Group President and CEO, Danny Bennett remarked, "Tony And Diana performing the music of George and Ira Gershwin at the legendary Rainbow Room in New York City exemplifies the classic standing and timeless legacy of these two amazing artists. As Tony has always said, 'Quality never goes out of style…and Tony and Diana are proof positive of that statement.'" LOVE IS HERE TO STAY was produced by Grammy Award winner Dae Bennett and Bill Charlap with Danny Bennett as Executive Producer. It will be released on CD, vinyl, digital and streaming platforms. The Bill Charlap Trio features Bill Charlap on piano, Peter Washington on bass and Kenny Washington on drums. GUINNESS WORLD RECORDS (GWR) is the global authority on record-breaking achievement. First published in 1955, the iconic annual Guinness World Records books have sold over 141 million copies in 22 languages and in more than 100 countries. Additionally, the Guinness World Records: Gamer's Edition, first published in 2007, has sold more than 4 million copies to date. Guinness World Records' worldwide television programmes reach over 750 million viewers annually and more than 3.3 million people subscribe to the GWR YouTube channel, which enjoys more than 450 million views per year. The GWR website receives over 19.9 million visitors annually, and we have over 15 million fans on Facebook. Quintessential New York glamour finds its home 65 stories above the landmark Rockefeller Center. Crowning the timeless Manhattan skyline, the iconic Rainbow Room offers a modern twist on classic old-world charm, tailoring special moments for private events. Since its debut in 1934, the Rainbow Room has drawn the world's elite to its curated, elevated and glamorous luxury. First operating as a formal supper club, the venue quickly became a New York City entertainment focal point. The Rainbow Room name was inspired by the installation of a color organ that automatically converted music into changing colors in harmony with the moods expressed by the music. To mirror this effect, crystal curtains were added to the newly restored Rainbow Room to create a light shimmering veil at the windows without hindering the view. In 2012, the New York Landmarks Preservation Commission declared Rainbow Room a New York City. Rainbow Room is one of the few interior landmarks found in New York City.